One of my favorite indulgences is those sparkling lemonades and iced teas you can get at coffee houses. They make me smile right up until I have to pay for it. They are not cheap! So I used to consider them the occasional treat, which is kinder to my pocketbook, but my taste buds were sad. Fortunately, I figured out a way to make everyone happy with a copycat version. You no longer need to go to a restaurant to enjoy your favorite dish as there is a good chance you can find a copycat version online. Of course, that also means you need to make it. And let’s not pretend that part of the thrill of eating out is the lack of clean-up afterwards. Or is that just me? I could easily drink 3-4 glasses of those fancy lemonades/iced teas a day, which would cost nearly $20. Ouch! But I can make my own version at home for a fraction of the cost. As much as I enjoy those drinks, I would rather use that money toward something a bit more meaningful. When you find yourself always ordering the same entree, snack and/or beverage every week, then it’s time to find a homemade or copycat version. I love to dine out and my preference when doing so is to order dishes that either don’t make sense for me to make at home or are beyond my skill set. Those are the dishes I leave to the pros and savor every single bite. I feel some dishes should remain a special treat. This is the perfect thirst-quencher on a hot summer day. The simple peach syrup keeps in the fridge for a week or two, and it’s my favorite summer beverage. You can also swap out the iced tea with lemonade or do half lemonade and half tea. In a small pan, add water, sugar and peaches and bring to a boil. Turn the heat down and simmer for 5 minutes. Remove from heat and let the syrup cool. 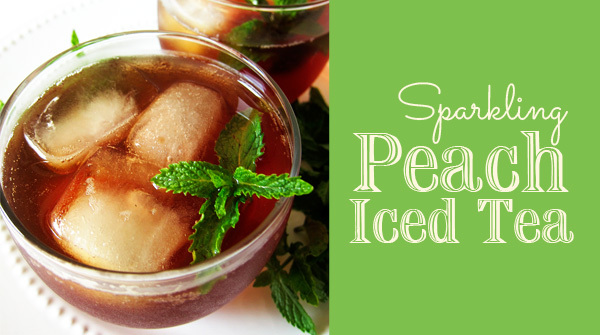 Once room temperature, strain out peach slices and refrigerate the peach syrup in a small, air-tight container. I actually like to eat the peaches as is, but you can add them to your favorite smoothie. Put 2-3 tablespoons of the peach syrup at the bottom of a tall glass. Fill about halfway with iced tea, then add ice until the glass is 3/4’s full. Top off with sparkling water. Stir and enjoy!